Our government may be shut down, but America’s broadband networks are alive and kicking, which makes me wonder what their status would be if some of our public-ownership-loving friends had their way. Maybe messages to public safety and doctors would be allowed but cat videos would be verboten. I’ll have to ask. 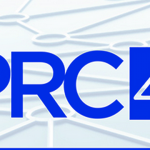 TPRC, the major Internet & broadband policy conference in the US concluded Sunday in Arlington, and it was a bang-up success again. This was the 41st edition of TPRC, which marks it as the grandparent of all telecommunications pow-wows. It’s an endurance contest in some ways, as Saturday’s events run from 9:00 AM to a dinner and talk that wraps out close to 9:00 PM. It’s a great time to meet policy researchers and catch up with old friends while wrapping your head around intriguing research on the economics, technology, and anthropology of broadband deployment and use. A number of novel and intriguing papers were presented, but the most interesting feature of the conference is the way the meta-trend has changed. In previous TPRC conferences, most papers addressed efforts to diffuse high-speed wired networks across various countries, and how to bring about full participation, but the emphasis is shifting to mobile networks, devices, services, and usage. The wired diffusion question is primarily one of policy and economics, and the answers are various forms of: 1) Facilities-based competition; 2) Wholesale unbundling; 3) Public ownership; and 4) Public/private partnerships. There continue to be a variety of policy choices around the world, colored in large part by local conditions and national rivalries. For example, Japan wanted a fiber network to ensure the country was on the cutting edge of technology deployment, so it adopted policies that made DSL unprofitable unless NTT, the incumbent phone company, invested in a parallel fiber network. It also ensured that the fiber network would be more profitable by setting wholesale rates on unbundled DSL below break-even levels and disallowing unbundling on the fiber network. Most striking in the chart of industrialized countries is the degree to which the U.S. has closed the gap with world leading South Korea. 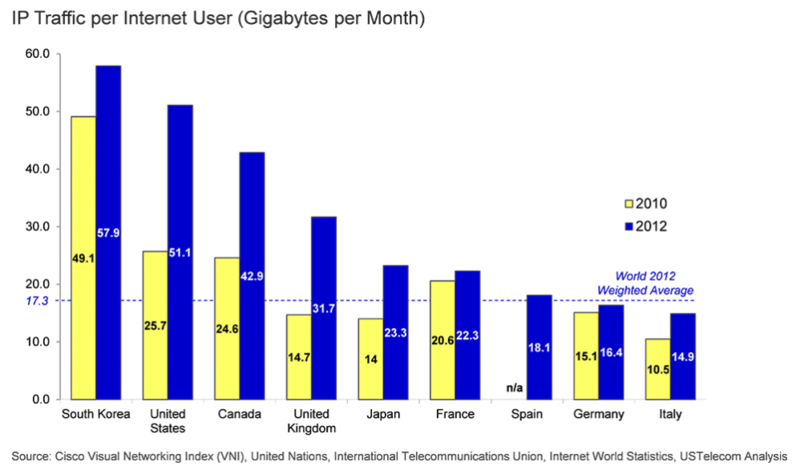 From 2010 to 2012, the U.S. traffic per user grew 98 percent, from 26 GB/user/month to 51 GB/user/month, while South Korea only grew by 17 percent, from 49 GB/user/month to 58 GB/user/month. In 2010 there was a 48 percentage point gap between the U.S. and South Korea; by 2012 the gap was only 12 percentage points. The U.K. more than doubled traffic per user, Canada grew nearly 75 percent, and Japan 66 percent. Continental European countries growth was relatively slower. Australia had a unique problem with the leader of the recently-privatized telecom incumbent that sparked a Labour Party initiative to remove newly installed cable networks deployed side-by-side by Telstra and Singtel Optus and replace them with a publicly-owned fiber network. That initiative, the National Broadband Network, is now on hold due to a changing of the guard in Parliament; the free market Liberal Party favors fiber to the node over fiber to the home, so Australia will get a hybrid network of some kind. The Parliamentary debates on network architecture in Australia have been breathtaking. Some consumers were reasonably aware of the [Ultra-Fast Broadband] rollout and the majority favored it. Consumers considered the UFB connection would be faster, smoother, impressive, like the USA, quick, stable, and instantaneous. Being like the USA is a laudable goal. The network runs at 100 Mbps per second, so it’s going to be on par with fast cable and fiber connections in the US, in fact. A number of approaches are being considered in increase acceptance. Aside from the traditional policy discussions on wired networks, there was a new emphasis at TPRC on mobile networks, devices, and applications, recognizing that smartphones are becoming the “first screen” for many people. As the perception and role of smartphones changes, it becomes incumbent on policy researchers to spend more time working out the policy issues relevant in the mobile space. These issues are quite different from those in the wired network space: Instead of discussions about competition policy, wholesale unbundling, and public networks, we’re talking about spectrum management, device interoperability, device subsidies, data plans, standards-essential patent licenses, and government spectrum. While there is some overlap, the emphasis is decidedly different. Broadband policy is becoming unwired; some would say “unchained” as well. More to follow on this theme. Hey, Internet: Maybe They’re Just Not That Into You!